Advertisements can trick you, making it essential to cut through the blubber and get down to brass tacks. The following is a Bluemax Chainsaw review that will help you figure out if this is the best chainsaw of its type. Most say that the Bluemax 6595 chainsaw is one of the most versatile and inexpensive chainsaws on the market. It can be used on many materials, but it is not meant for heavy use. The following are just a few pros and cons to consider. The Bluemax 6595 comes with anti-vibration technology that should help you cut through material with optimal precision. The chainsaw does come with a one-year warranty. There is a protective sheath, which helps the tool stay in good condition. The saw is relatively versatile and quite inexpensive, making it a great choice for beginners or those who do not want to break the bank when purchasing their saw. The chainsaw comes with an easy-start mechanism, which should definitely prove useful for certain jobs. The oil tank is not translucent, which makes it hard to tell when it is time to refill the tank. The Bluemax 6595 chainsaw does not come with extra storage. Any additional tools or blades may have to be carried in a separate bag or container. The chainsaw does come with a carrying case, but it is made of plastic, which means that it can break under the right conditions. The chainsaw comes with a strong engine. Its characteristics are great for high-powered jobs or jobs that take a while due to its high quality cylinder. It also comes with an auto oiler, which keeps the bar lubricated. Q -- Does the chain come with a break?A- -- Yes, the Bluemax 6595 chainsaw does come with a chain break. 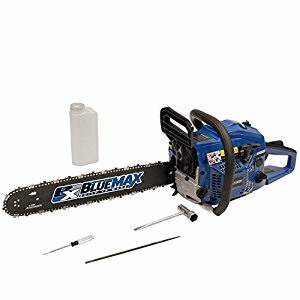 Q -- How big are the bars that come with the Bluemax 6595 chainsaw? A- -- The saw comes with 14 inch to 20 inch bars. Q -- What type of cylinder comes with the chainsaw and how does it affect its performance? A- -- The Bluemaxx 6595 comes with a 45 cc single cylinder, which is about right for its size. It is a two stroke cylinder with 2800 rpm. Its ignition system is CDI. Q -- What is the saw's pitch and gauge? A- -- The Bluemax 6595 chainsaw's pitch is 0325 inches. The gauge is 0055 inches. Q -- What type of chain tightening system does the Bluemax 6595 chainsaw come with? A- -- It has a standard screwdriver tightening mechanism. This means that it has to be tightened with a regular screwdriver. The bar nuts need to be loosened to re-tighten the chain. No doubt that the downside to this chainsaw is that it cannot handle heavy duty work, but it is an inexpensive chainsaw. It is meant for lighter work, but it does provide adequate power, making it a great saw for its purpose.